Have you ever tried guacamole on a burger? It’s delicious! 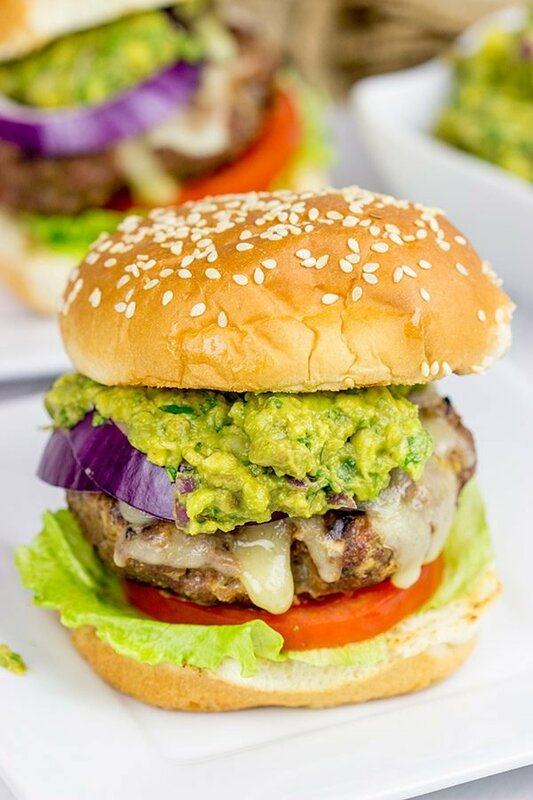 These Grilled Guacamole Burgers are a summer backyard favorite! A couple of weekends ago, Laura was hunting for local events in our area. And she landed a really good one. A jazz band. But not just any jazz band. A jazz band for kids. Our local library hosted a concert by the Mother Goose Jazz Band, and Robbie loved it! I’m dead-serious when I say that he started stomping his foot along with the music. He was that excited! It was literally a foot-stomping good time! When Laura first mentioned the Mother Goose Jazz Band, I just laughed and shook my head. Is this what life is like as a parent? And why is there even a Mother Goose Jazz Band in the first place? Well it turns out that kids’ songs work really well when set to jazzy rhythms. Plus, Robbie loves (I mean loves) bluegrass music, so it kinda makes sense. And what’s more, the Mother Goose Jazz Band actually has some famous connections. Their recent album includes vocals by a founding member of the Manhattan Transfer as well as Chris Brubeck on bass. The name Brubeck rang a bell, and sure enough Chris is the son of the great jazz musician Dave Brubeck. When I was in middle school, my Dad took me to several jazz concerts including Kenny G and Dave Brubeck. (I credit that with why I enjoy jazz music today.) I’m doing the same thing with Robbie…we’re just starting a bit earlier! And we’re starting with a jazz version of This Little Pig Went to Market. After our foot-stomping good time at the library, we came home and played with Robbie on the back deck. The afternoon was nice and warm…the kind of afternoon that just requires hot dogs and hamburgers. So I decided to make some burgers for dinner, but I put a little twist on ’em. 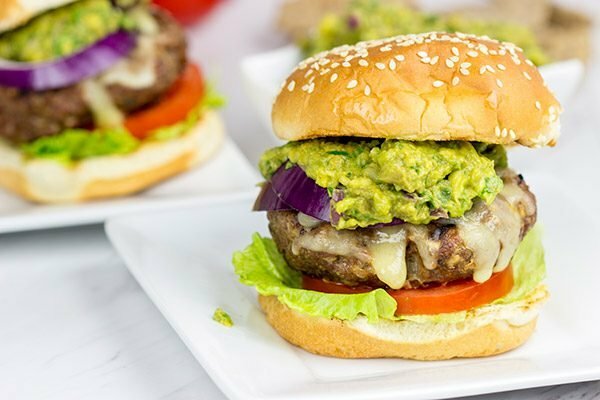 These Grilled Guacamole Burgers were top-notch! I essentially just made my go-to burgers and topped them with my go-to guac recipe. I love guac alongside a Mexi-beer and tortilla chips, but I gotta say that guac on a burger totally works. 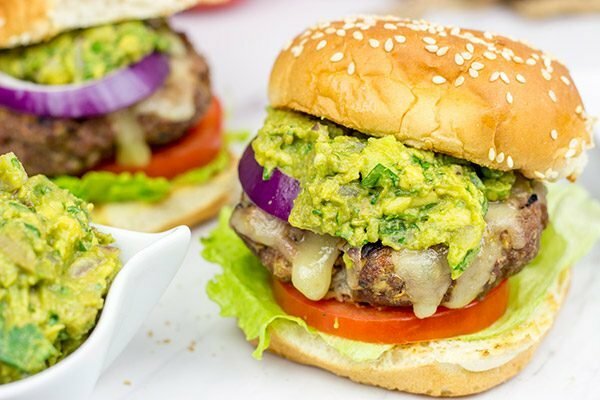 These Grilled Guacamole Burgers will definitely be making an appearance again this summer! How do you guys like your guac? I personally like mine extra limey and extra cilantro-y. I add onions, but no tomatoes. And I usually add a bit of extra salt after I make the recipe. But that’s just me. 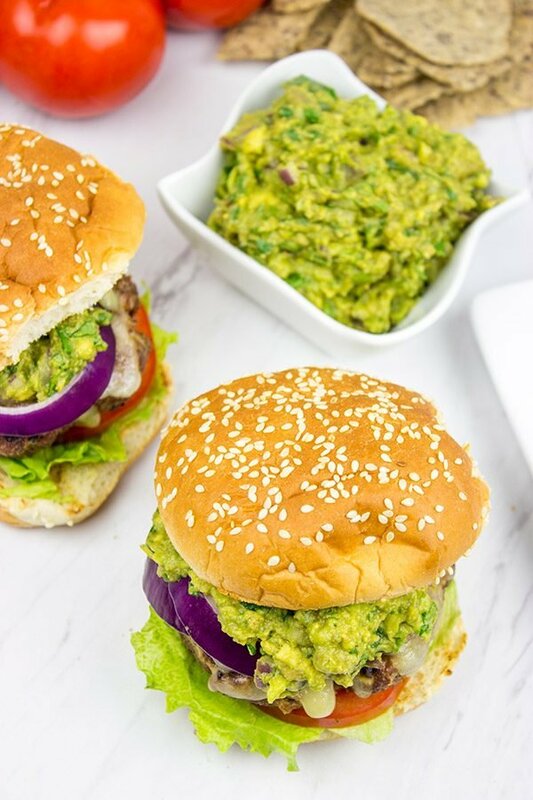 You could absolutely just use your favorite guac recipe to make these Grilled Guacamole Burgers. Just make sure you have a nice warm day and some jazz music playing in the background! Bonus points if it happens to be a jazz version of Three Blind Mice. Cheers, friends! Add all guacamole ingredients to a medium bowl. Using a fork, mash until well combined; set guacamole aside. 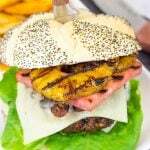 Grill burgers on medium-high heat for 10-12 minutes, flipping once, or until fully cooked. Sprinkle tops of burgers with Pepperjack cheese. Close lid and continue cooking until cheese has melted. Assemble the burgers with guacamole, tomatoes, onions and lettuce. Robbie is just the cutest! Stomping his little feet to the music – how adorable! I can’t get over the adorable picture in my mind of Robbie stomping his little foot. Is it weird that now I want to see the Mother Goose Jazz Band in concert? That sounds like so much fun; I sing kids songs to Cookie all the time. She’s a big fan of The Wheels on the Bus :). As for guac, I’ll eat it pretty much any way I can get it, but when I make it at home I always add extra, extra lime and lots of jalapeño. These burgers look AWESOME and they’re making me so excited for summer cookouts. Have a great day, David! Hey, I can tell ya where to find the Mother Goose Jazz Band! (Spoiler: It’s a long way from Phoenix…but it’s close to Syracuse.) Do you sing Wheels on the Bus with a jazz beat? If not, then you should totally try it out sometime. Cookie’s mind will be blown! 🙂 I love the jalapeno + lime addition to guac…sounds pretty similar to the way I like it. Happy summer grilling, Kelsie! Hi David. Aren’t you glad to be back grilling. I’m doing burgers tonight, but unfortunately I don’t have an avocado. These look like the kind of burgers that you better lean over your plate when you dive in. That jazz fest sounds like great fun for kids as well as adults. I always was of the opinion that reading and music should be introduced to children at a young age. Oh man, I am SO glad to be back grilling again, Dorothy! I usually don’t mind the first half of winter, but come late January or so I really start eyeing up that grill like you wouldn’t believe! So I totally agree with you about reading and music at a young age. It helps that Robbie loves music, but the live concert last week really took the cake! He was seriously stomping his foot in excitement. Haha! Robbie is at such a good age – your story (and that video Laura posted) about Robbie’s foot stomping to that jazz band reminded me of that time The Wiggles came to town when Lil Shashi was actually little and gosh – she was over the moon! Yes! You saw the foot-stompin’ that I’m talking about. How funny was that?? Oh my gosh, I totally remember the Wiggles. They were more like my sister’s generation I think…but that still takes me back! So Lil Shashi has excellent taste in guac! Hah! Although, to be fair, any guac would work for these burgers. I have to admit that I’m a purist when it comes to guac, so I wouldn’t go for the Ro*Tel…but I also wouldn’t turn it down if it was sitting in front of me with a pile of chips! 🙂 Have fun out on the West Coast…I didn’t know you were heading out of town! Take lots of photos, my friend! Love the idea of a jazz band for kids. Start them early, right? Guacamole is one of my favorite things on the planet – no joke. And burgers aren’t far behind. So I’m loving this idea. And that burger photo is absolutely mouthwatering!! Thank you so much for the kind words, Marissa! Try mixing up some guac and putting it on a burger this summer. It’s a fun little twist! 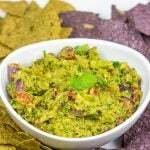 All that guacamole made my mouth water as soon as your website loaded! There are jazz bands for kids?? That’s pretty awesome. I’m so happy Robbie loved it, I can just image him stomping his cute little feet along to the music. I love the name Mother Goose Jazz Band, I think I would have the same reaction you did Davids lol. Who doesn’t love bluegrass music? I know I do. These guacamole burgers look tasty and oddly refreshing. They absolutely do have a jazz band for kids! When Laura found out about the free concert at our library, I thought it was partially a joke. But this jazz band was legit! And Robbie absolutely loved it. 🙂 And when he started stomping his foot to the music, I almost died laughing! Thanks, Mary! There is always some Jazz playing in the background of my kitchen – it is my favourite kind of music. Glad Robbie had a stomping good time, I can imagine that kid’s songs work really well for jazz. Guacamole is incredible, I could eat it every day – never tried it on a burger but I will certainly give it a try next time 🙂 Have a great weekend, David! So you might always have jazz playing, but have you ever had kid’s jazz playing? Like the Wheels on the Bus set to a jazzy rhythm? It’s seriously hilarious…but in the best kind of way! Thanks so much for the kind comment, Miriam. I hope you have a wonderful weekend, too! You know, I have to give 100% fo the music credit to Laura here. She’s the one that was always playing bluegrass on Pandora when Robbie was younger. (Well, to be fair, when I got the phone, the Pandora station switched over to Journey…haha!) Oh my gosh, those must be such great memories of singing the classics with your Dad when he was home! Oh man, I can’t wait to hear about your bean burger. I’ve tried them a couple of times, and they’re good…but keeping bean burgers moist and juicy is always a challenge. Thanks, Neil! I’m totally with you on the cilantro and limes David!!! How have I never put guac on my burger??? Avocados make them more amazing but I’m thinking guac takes it to a whole new level. My daughter is the guac maker in our family so this will be fun to try for sure! Mother Goose jazz band…I can’t tell you how many times I’ve asked myself, ‘is this what life has become as a parent’….Lol. The good times keep coming! Hey there, Lindsay! Guac on a burger is a must-do. Like this weekend! Or tonight. Or heck, right now! 🙂 I wish you could’ve seen the look on my face when Laura told me about the Mother Goose Jazz Band. But then on the flipside I wish you could’ve seen the look on my face when Robbie started stomping his foot along with the music! (Well, I say it was along with the music, but I think he’s got his Dad’s sense of rhythm. Haha!) Thanks so much, my friend. Have a great weekend! Whoever first thought to put guac on a burger deserves some kind of award. These look INSANELY good. Like, INSANE. I agree, Karly! Guac + burgers + warm summer day = perfection. Oh, and maybe a margarita or cold beer in there, too. Haha! Hope you have a great weekend, my friend! The Mother Goose Band sounds like a load of fun. I like my guacamole with tomatoes and no cilantro. I am not a fan of cilantro, sorry. Even with the cilantro I know that I would love these burgers. They look delicious!! That Mother Goose Jazz Band was just too awesome, Dawn! I wish you could’ve seen the look on Robbie’s face when they started playing. 🙂 Hey, that’s all good that you don’t do cilantro. Leave it out for your version! (Or just give it to me…haha!) Thanks so much! I want to go to Mother Goose Jazz Band! 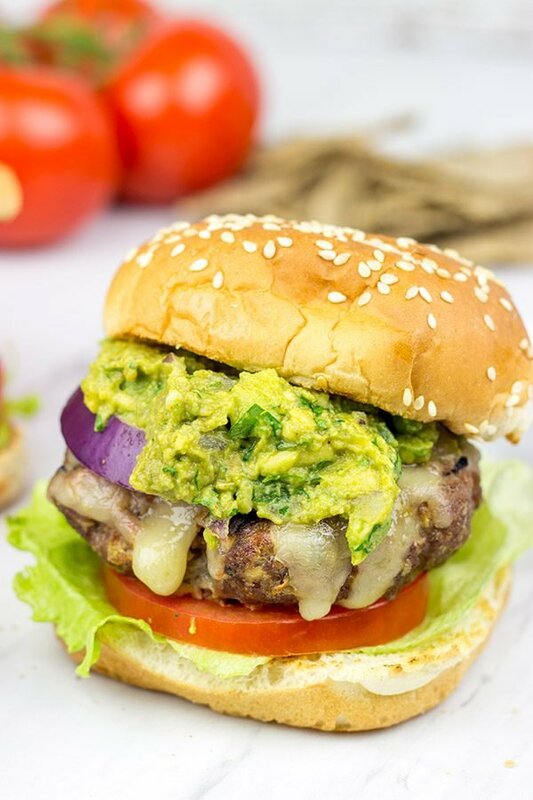 I love guacamole on burgers – it makes me feel healthy because I can skip the mayo! 🙂 Oh the tales I tell myself…..
Come on up, Rachelle! We’ll scout out the next show for the Mother Goose Jazz Band. Maybe we can even become groupies! 🙂 And I’m loving the logic behind the guac on the burgers meaning no mayo. Haha! Hope you had a great weekend down there! 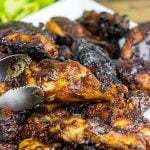 You have the best cinco de mayo recipes on here!! I wouldn´t know what to make first 🙂 Question: why do you add chipotle powder to our guac? Does it add something different? Hey Johlene! Thank you so much for the kind words. 🙂 So I like adding a bit of chipotle powder because it brings a subtle smoky flavor to the guac. And since guac is usually served outdoors during the summer, the bit of smokiness is nice. Of course, this is just personal preference, and you could totally leave that little bit of chipotle powder out!